Want to Be the Owner of Life Cafe? 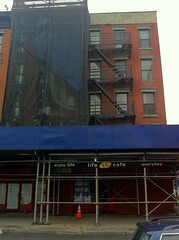 It may be too late to buy the CBGB name, but you can now snag Life Cafe’s. A few weeks after the failure of negotiations to bring the legendary corner spot back from the brink, its trademark is now up for grabs. A Craigslist posting offers up the right to use the name of the cafe – “immortalized in the Pulitzer Prize-winning Broadway musical ‘Rent’” – for restaurants, t-shirts, cups, and marketing material. To sweeten the deal, the ad says the “current East Village liquor license may be available” and offers up the services of John Sunderland, the artist responsible for much of Life’s branding and its fanciful chalkboard menus. Hey, if you want to own a piece of East Village restaurant history, it’s either this or those Ratner’s buttons. 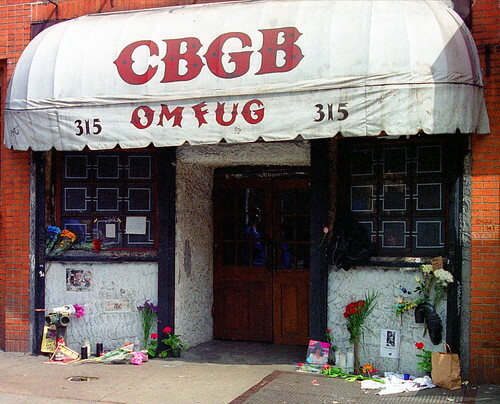 Francisco Daum Flowers outside of CBGB in 2001, after Joey Ramone died of lymphatic cancer. The CBGB brand — and the merchandising empire that comes with it — changed hands three months ago, a representative of the new owners told The Local. The spokesman added that his group bought the CBGB estate from Lisa Kristal, the daughter of the founder of the club, Hilly Kristal. A man who answered the phone at Ms. Kristal’s number had no comment regarding the transaction.